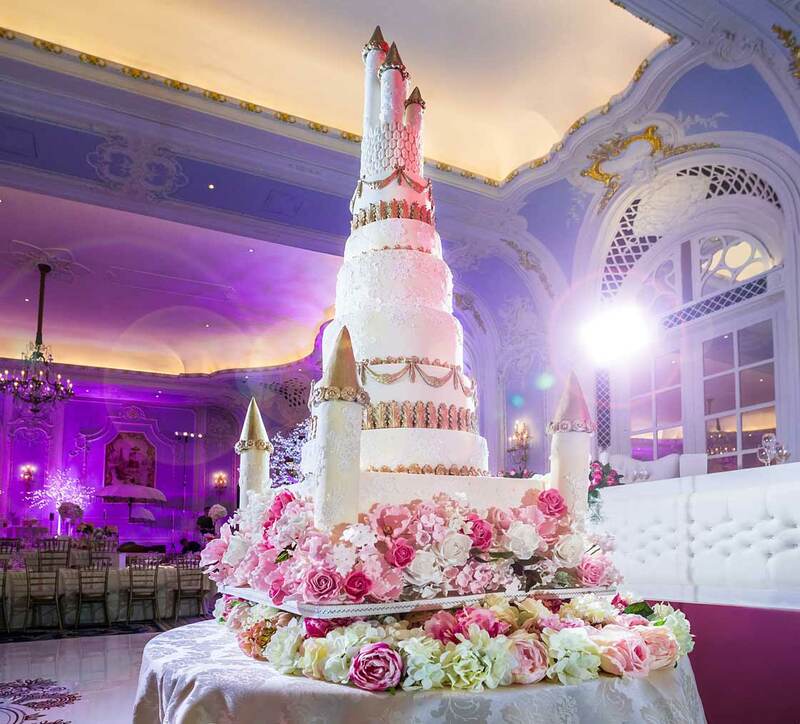 They say that dreams do come true and at Elizabeth’s Cake Emporium we had the pleasure of fulfilling one of our bride’s wedding day dreams by making an eight foot fairy tale castle cake for her luxurious wedding at The Savoy. The renowned Savoy hotel (a firm favourite at EC Emporium HQ) consistently ranks as one of the best hotels in the world and we are delighted to be one of it’s preferred suppliers of several years standing. The hotel’s enduring showmanship has attracted people down the generations from royalty, the arts, business, politics and the law. The Savoy has the rare distinction of overlooking the River Thames, and the separate Riverside Entrance, on a quiet road away from the main hotel entrance was very convenient for delivering such a grand wedding cake with military precision. The baroque style grand wedding cake was displayed on a large round table and featured a huge base completely adorned with hand made sugar flowers including sugar roses, sugar peonies, sugar blossoms and hydrangeas and 24 carat gold painted sugar butterflies. 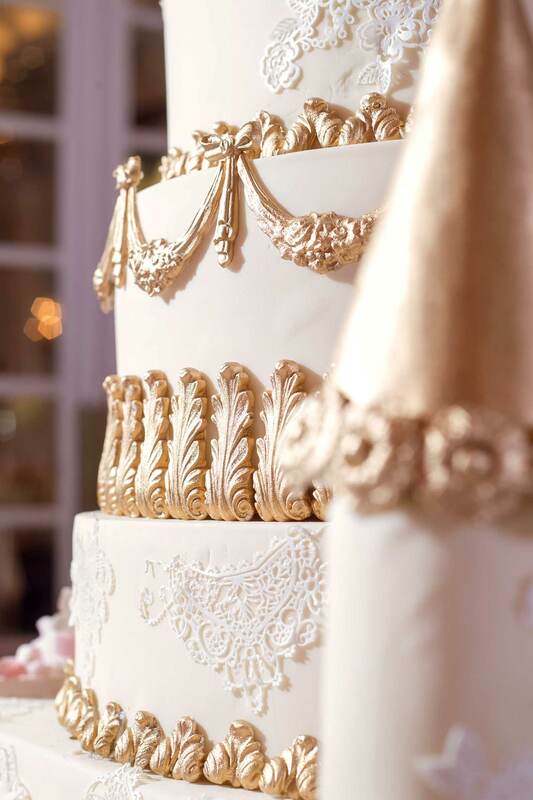 All the tiers and turrets of this show stopping edible work of art were enrobed in Ivory Massa Ticino sugarpaste by Carma for a flawless base and embellished with pearlised edible lace, gold baroque swags and other beautiful mouldings. The flavours chosen by our couple included our famous Chocolate Bailey’s cake, Red velvet with white chocolate filling, Luscious Lemon and Vanilla Raspberry Ripple. The cake looked very much at home in the opulent surroundings of the Lancaster Ballroom (the turrets nearly touched the ceiling!) 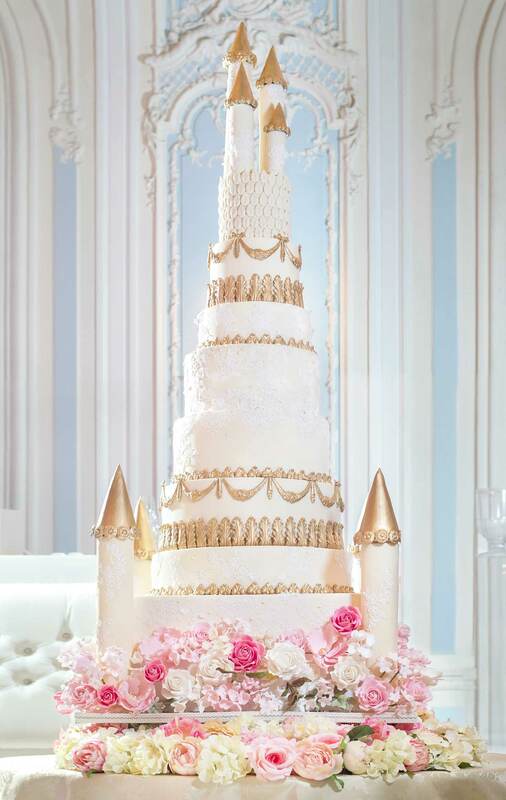 and our fairy tale castle wedding cake has been deemed the ultimate in wedding cakes as the images went viral on social media and it was also the subject of an article in the Huffington Post.